Are 500 Euro notes accepted by banks in Spain? I am going to Spain and have some €500 notes. I have been advised that they are not accepted. Will the banks accept them and change them? They are practically very rarely accepted. Not sure about how legal that is, but some stores even explicitly put signs they don't accept 500 EUR bills. For banks - I would be surprised if private banks where you don't have account, would go for breaking 500 into five 100s for you. Probably only the national bank would do that - not sure how that works in Spain and how available are they. 500€ banknotes are perfectly legal in EU, and as such they are accepted all over the EU. They are however been used a lot for criminal activities, so it's been decided that they will be faded out before the end of 2018; they were used a lot in Spain, especially, and on the opposite they now quite disappeared. Spanish Here. They are rarely accepted because of security concerns, and usually (in small stores) that extends to 100 euro and 200 euro notes also. If you need to use them, you can always ask for change in any bank. In almost every major and minor store, supermarket and bar, there are signs / drawings / notices that state : "The cashier won't accept cash payments of over €100/200/500" depending on the size of the store. The reason? to prevent dealing with false notes, to prevent money laundering, and to prevent having to deal with lot of cash (and its inherent responsibility) in case of robbery (doesn't happen as commonly as in USA, but is a legit fear to have). PS: there's also a law that completely bans any type of cash transaction of over €2,000. 59.1.e) del Real Decreto 2816/1982 - every public oriented company is free to pick which clients it wants to serve, as long as the requirements to meet are not racist / of hate. This article clearly states that a store, bar, or whatever, can refuse to serve you as client as long as there is no invalid reason (race, religion, skin colour). Sources: I live in Spain. 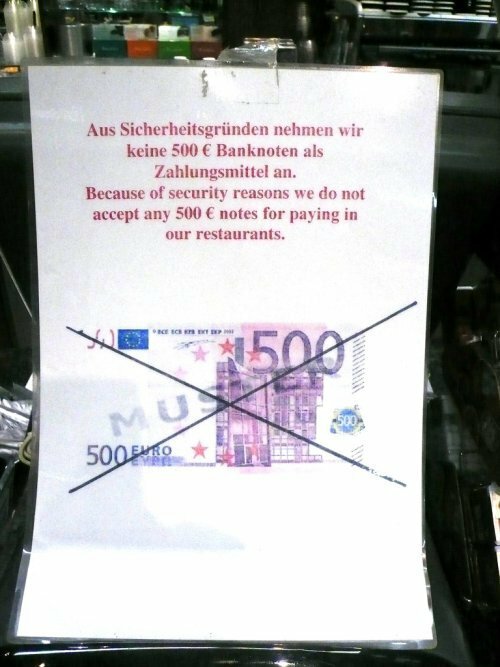 In many countries in the eurozone, shops tend to post signs along the lines of “we refuse banknotes larger than €100” for various reasons so in that sense, €500 would indeed not be well accepted. They are however still perfectly valid, even as the ECB announced it would stop issuing new ones. In general private banks should therefore have no problem with it but might not necessarily offer cash services to non-customers. If nothing else works, you should however be able to exchange them at one of the branches of the Banco de España. No matter what you do, if you want to change a large amount of cash, you might have to present ID or satisfy some other reporting requirement. Yes, they are accepted, of course. 500 euros notes are perfectly legal. As stated before, you might have trouble using then in some places. In the other hand, there are places that will accept them regardless of the amount you buy. One of this kind of places is one of the biggest commercial galleries chain in Spain, called "El Corte Ingles". Those stores are almost everywhere (in all big cities, and most smaller ones), and will accept your bank note without hesitation, even for small amounts bought. You can go there, buy a 12€ music cd, for example, and get your change in smaller notes. Banks: It has been mentioned that banks will accept to change 500€ notes. Don't count on this! I have been present (I live in Spain) when people try to do just this and get refused. There seems to be some discretion here, but its impossible to fathom. The main argument used is that it is the bank's policy not to change money for non-clients and that it has to go through an account, i.e. you pay your large note into your account and take money back out of the account in whatever form is convenient for you. The idea being to generate a paper trail for possible fraud or money laundering investigations. As others have posted, the €200 and €500 bills are not accepted in small stores, for amounts easily payable with lower denominations. I worked ten years ago at a fast food restaurant and we were responsible for any cash imbalance -- meaning a counterfeited €500 bill could ruin your monthly pay... one or two months! Having said that, and despite the fame of Spain regarding the number of €500 bills here, for normal people these bills are extremely rare to see, so having to handle one of these is awkward. The same applies, and these are even rarer, for €200 notes. Banks will accept them, most retailers won't. You will be able to exchange those 500€ bills for smaller ones at the bank, still you will need to carry all that money with you. Why not just put the money on a savings account and use a credit/debit card. I don't know where you live, maybe you will loose a small exchange fee but walking around with a lot of money means you can loose all of it. My boss had his wallet stolen last year in Barcelona. I'm not saying crime in Spain is higher than somewhere else, just advising not to take any risks when it's not necessary and you will not gain a lot by taking the risk. The EU may have a Legal Tender rule similar to the US (I do not know). If so, then technically, they cannot be refused. However, there are practical considerations that make such large denominations difficult to use. The most common reason is the merchant's simple inability to provide change. In the US, many merchants try to keep less than $100 in the register. It was explained to me by a banker friend that a business can refuse a large bill by simply refusing the transaction. This is legal because they are not specifically refusing the note and "having only $100 notes" is not a protected class. A retail bank should accept the note without issue. Note, I am fully aware that a merchant is not compelled to accept any current for any reason. There is no misconception here. Not the answer you're looking for? Browse other questions tagged money spain exchange or ask your own question. Are post-2013 US $100 bills widely accepted in Mongolia and worldwide? India just demonetized all Rs 500 & 1000 notes. What do I do with my leftover cash? How can I exchange Rs 500 & 1000 notes in India as a foreigner? Can I deposit 500 Euro banknotes at bank in Netherlands? Are 2008 100USD paper notes too old to be exchanged in the UK? Can I exchange damaged Euro notes in India?